Sponsored article: These LEED-certified spaces show how the firm is helping transform the South Atlantic region. Feature image: North Barclay Green Apartment Complex. Photo credit: Paul Burk. A partner with USGBC in the South Atlantic region, Moseley Architects is a full-service architectural, engineering, planning and interior design firm that sees green building as a core component of their corporate culture. Staff work with clients to achieve substantial sustainability and energy efficiency goals, and the firm’s project list boasts over 130 LEED projects. Outside of their professional duties, the firm’s Seeds of Green program encourages staff to participate in community service projects that support green building and awareness of resource conservation. Not one to shy from a challenge, the firm has headquarters in Richmond, Virginia, that combine local historic preservation requirements with significant sustainability measures. Earning LEED Platinum in 2009, the headquarters was the fourth building on the National Register of Historic Places to accomplish this feat. 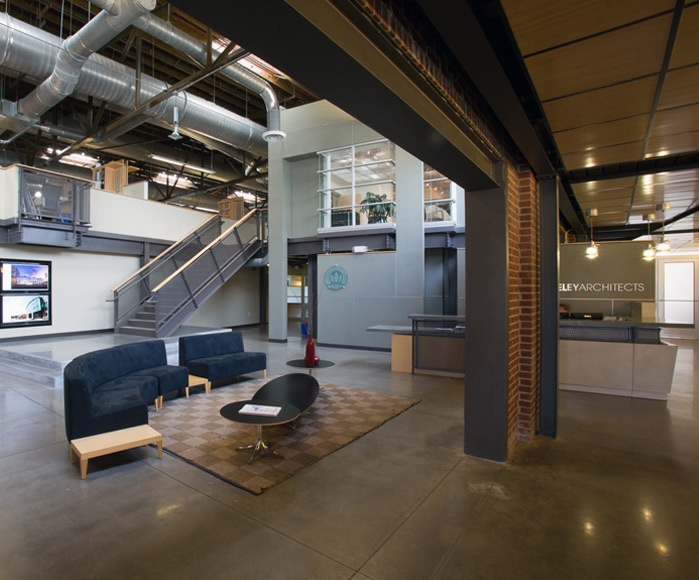 The building is located in one of Richmond’s industrial districts and is a renovation of a 1930s structure that served as a manufacturing construction yard and warehouse. After deciding to relocate to the larger space, the firm’s project team was tasked with respecting the building’s historic significance while incorporating new technologies that would allow it to be showcased as an exemplar LEED building. Moseley Architects headquarters. Photo credit: Meghan McSweeney Photography. As part of the preservation, the team was required to include the original skylights and garage door openings into the design, which supported the LEED goal of incorporating natural daylight. The preservation of the building also helped the project achieve 12 out of 14 of the LEED Sustainable Sites credits, as well as historic preservation tax credits through the Commonwealth of Virginia’s Department of Historic Resources. Other sustainable features of note include a rooftop garden, outdoor views from every workstation, the use of rapidly renewable materials like bamboo and sunflower board, low-flow plumbing fixtures and waterless urinals and an aggressive stormwater management plan. Moseley Architects’ president, Stewart Roberson, explains that the firm is “very proud of our record as a sustainability leader, one that has been established over decades of commitment and investment. Clients and colleagues have to look no further than our corporate office in Richmond to see that we regularly ‘walk the talk,’ demonstrating how our own devotion to promoting sustainability can be replicated across all of the communities we are fortunate to serve,” he says. 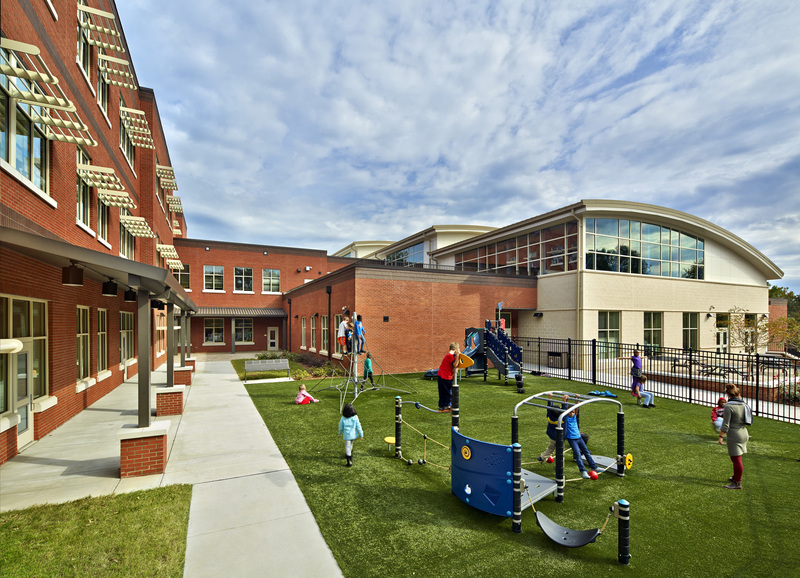 The first LEED Platinum elementary school in North Carolina, Northside Elementary School in Chapel Hill serves as a model green building for the community. Early in the design process, the project team collaborated with educators to ensure that the school’s sustainability features not only supported resource conservation and energy efficiency goals, but could also be used by students as a living laboratory. Some of the green building components include a garden roof area connected to a science classroom, a comprehensive stormwater management system, porous playground surfaces and interior light shelves to maximize daylight and reduce energy usage. Signage around the building and property highlight sustainable features for the benefit of staff, students, parents and community members. Northside Elementary School. Photo credit: James West Productions. The school’s original goal of achieving LEED Gold was surpassed because of the deeply collaborative nature of the project. Ashley Dennis, Moseley’s Raleigh office operations manager and a team member on this project, noted that they were dedicated to finding creative ways to tackle environmental problems and reduce utility bills. “We strive to design solutions to meet our clients’ needs, and that look good while being sustainable, energy-efficient and durable,” says Dennis. 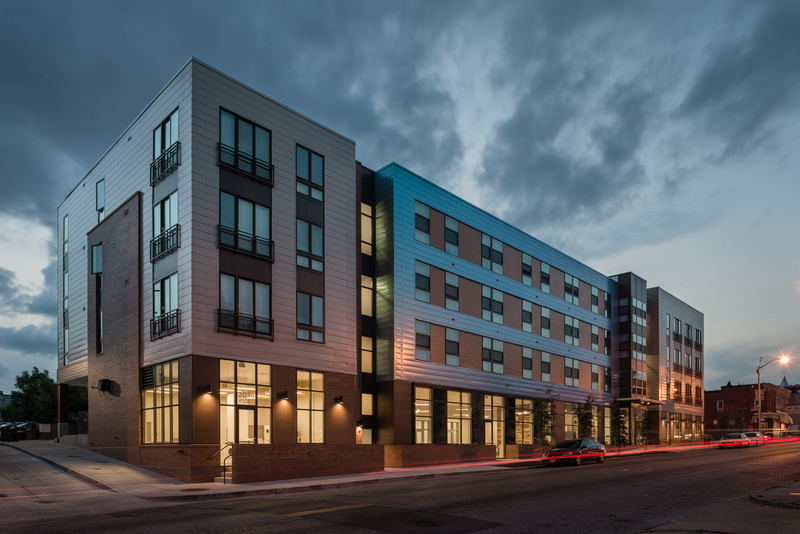 At the LEED Gold North Barclay Green Apartment Complex, in Baltimore, Maryland, Moseley Architects partnered with the Telesis Corporation to work with community members in developing a neighborhood vision that incorporated LEED strategies. This engagement process allowed community members in the underserved neighborhood to be empowered by the design process. The project incorporated both renovation and new infill construction, with a focus on high performance and sustainable residential design. North Barclay Green Apartment Complex. Photo credit: Paul Burk. The final complex includes green roofs on all three buildings, high-efficiency heat pumps and plumbing fixtures and drought-tolerant landscaping. To help reduce construction waste, the structure uses panels constructed off-site and installed in place. The sustainable design of the project provided the neighborhood with updated resources that will support them for many years to come. Learn more about Moseley Architects.